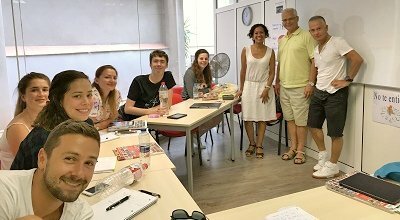 This is the most popular of our Spanish courses, as it is intensive enough to help you make rapid progress with your Spanish, whilst at the same time allowing you plenty of free time to explore Barcelona. 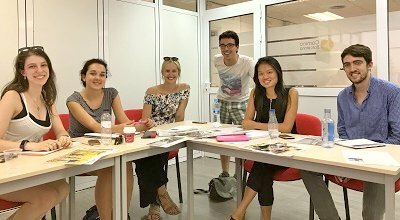 Every Monday for all levels of Spanish from complete beginner to advanced. 4 classes per day, 20 classes per week. If you would like higher or lower intensity of study, please consult our course page to see all of our courses. If you like, you can join our afternoon club free of charge (10 hours per week, from 16:00 till 18:00 Monday to Friday), where you will be able to use our facilities to practice listening, speaking, writing, and reading skills always with a teacher available to assist you as necessary. 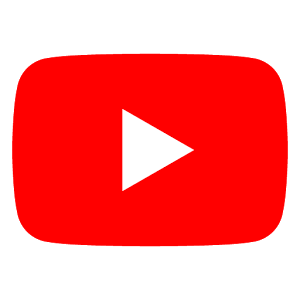 Your level of Spanish will be assessed by an inital online written test and by an oral test at the school on the first Monday of your arrival. 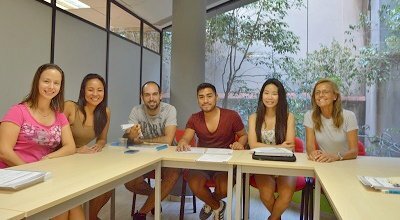 You will be placed in the intensive Spanish group of your exact level. You can choose to study for any period of time from 1 week to 1 year. It is also possible to come a few times for short periods, every time continuing your learning exactly where you left it. 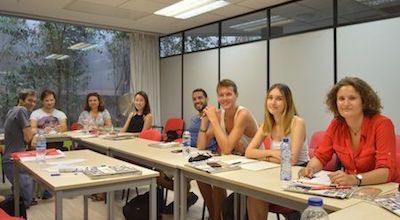 Improve your Spanish and enjoy your time in Barcelona by joining in our daily activities, such as salsa parties and paella classes on the school terraces, guided walks around Barcelona, visits to places of interest, as well as weekend excursions - always accompanied by one of our native Spanish teachers! Each class academic hour is 50 minutes of Spanish study. Each set of Spanish study materials (two books and 2 audio discs) costs €35 to buy (or €5 per week, to rent). There are two types of certificates provided by our school: the attendance and achivement certificates. The attendance certificate is given to every student at the end of their course, providing that they attended at least 80% of their classes. The achievement certificate is usually used to claim academic credits for students' University degrees. There will be no group classes these days. Instead, we will offer excursions on these days. 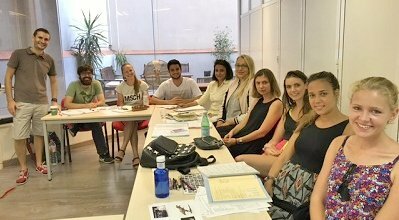 If you have no prior knowledge of Spanish you will be placed in the complete beginners' group which is open every Monday of the year. 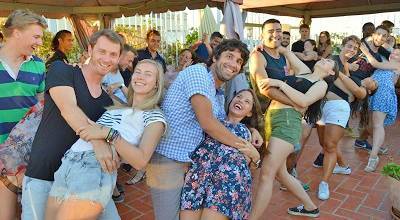 We welcome students of different ages and nationalities all year round. To check our age, student numbers and nationality statistics for our intensive Spanish course for the last 12 months, please consult why Camino page. Our school is not only accredited by Institute of Cervantes, but belongs to the top 5% of schools with the highest Cervantes accreditation score. To read more about Cervantes accreditation please follow this link. Our school uses a communicative methodology, which is the most efficient way to learn a foreign language. Every teacher of our school spends more than 30% of their time at school in training and formation to develop and improve teaching in our school. 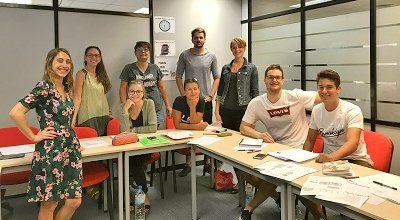 Our students enjoy their course and are very happy with their progress in learning Spanish. 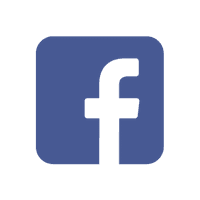 Please read our Google and Facebook reviews to find out about their experiences! The registration fee is 60 euros, paid once. Course prices include the Spanish lessons, placement level test, attendance and achievement certificates, the majority of events on our 7 day a week cultural and fun activity programs, and Spanish afternoon club use of school facilities for assisted self-study (library, videos, computers, classrooms, TVs and audio aids, etc). Test Your Level Request your Free Trial Day Check Availability Book Now! 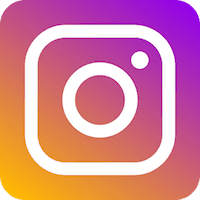 If you are interested in a Spanish course of a different duration or would like to find out the total price of your course and accommodation, please use the calculator below. Please do not worry about the level of Spanish you choose in the tool. This question is just to give us an approximate idea of your Spanish level. Your exact level will anyway be assessed by our written and oral level test before placing you in a suitable group.